Are you loving Sale-A-Bration? Have you been following my Sale-A-Bration of the Week on my Facebook Page? In case you've missed them I thought I'd create a post with the ones that have been so far. But keep checking my Facebook Page because I'll share a new one each Wednesday (NZ). The first was the Amazing You Bundle - this is made up a Level 1 reward (Amazing You stamp set) and a level two reward (Celebrate You Thinlits Dies). Here are some projects I've made with this beautiful set. Secondly was the Beautiful Peacock stamp set. This set has a beautiful soft floaty tail for the peacock which is so versatile. Use the feathers as a tail, a flourish or a swirl. There are some more samples and details of the stamp set on page 7 of the Sale-A-Bration brochure. Next is the Mixed Medallions Card Kit. Yes, you can get a whole card kit absolutely free, when you spend $110 before shipping. You don't need anything else to put the kit together, not even adhesive. It's all there for you and so easy to make some lovely cards. Are you ready to see how easy they are to make? The Happy Wishes stamp set is the second the Level 2 reward. A Level 2 reward is one you earn if you spend $220 (before shipping). It is a larger, more valuable reward, and you can choose one of these over two Level 1 rewards if you'd like to. In this case, the Happy Wishes set is a sixteen piece rubber stamp set with two large images and the rest are smaller, complementary sentiment images designed to coordinate with the bigger images, or be used on their own. Lastly, for now, is the Epic Celebrations stamp set. In the video you can see how you can use this stamp set with your Stampin' Blends, Aqua Painters or Watercolour Pencils to colour the images. Go and have a look at page 12 of the Sale-A-Bration brochure to see this fun Level 1 stamp set. 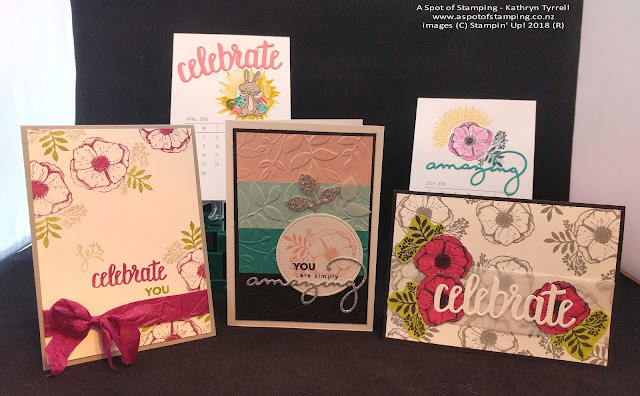 And remember - all these items are available for you to choose for FREE when you spend either $110 or $220 (NZD and before shipping) on Stampin' Up! product. What's not to love about that? I'll continue to share with you a Sale-A-Bration of the Week product on my Facebook page each Wednesday, so make sure you follow me so you don't miss out. Also, Stampin' Up! are releasing some brand new options on the 16th February, so there'll be some fun new options to see soon. These will include both Level 1 and Level 2 products. I'd hate for you to miss out though, some of these items available now have been pretty popular and when they're gone they're gone. * So if you see something you love - order it from me today. *Product availability may be limited towards the end of the promotional period.